The railway cost £6,000,000 to build - twice its projected costs. The railway never reached Barnsley, only getting to Stairfoot two miles short of the town. The railway carried substantial quantities of New Zealand and Australian wool between the Hull docks and West Yorkshire woollen mills. The first of two swing bridges crossed the Ouse between Drax and Barmby. Two fixed 77ft 6in spans on either side of the river, plus a main section of 248ft. The swing span weight 649 tons. There was 15ft clearance at high water. Wrought iron was used in a bowstring construction. The bridge was designed by Shelford. The bridge was controlled using hydraulics supplied by Sir Wim Armstrong, Mitchell & Co. The hydraulics were powered with steam, with the boiler engine, and pumps housed in the centre pier. There was a very interesting 'latching' system which ensured a true rail connection, and also connected the signal wires (the box sat on top of the centre section). The bridge could theoretically be rotated through 180 degrees and give a sound rail connection, but the wires would have connected to the wrong signals. 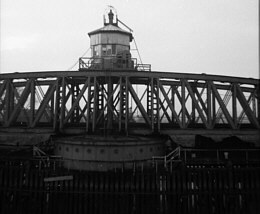 The second swing bridge crossed the River Hull on the Alexandra Dock high level. Smaller than the Ouse Bridge, but used a very similar design. Hull handled only 600,000 tons of coal in 1880, but 2,200,000 tons in 1900. The H&BR was the last large Victorian railway built apart from the Barry Railway. 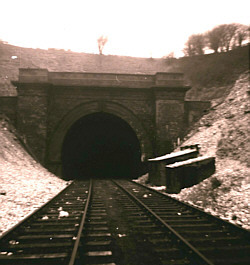 The deepest cutting of 83 feet was at the top of the incline approaching Drewton tunnel. The line nearly went into receivership just a year after opening. The line was double throughout its length. The line accommodated fifteen stations. The longest tunnel on the line was Drewton at 2116 yards. The length of the line was 53 miles between the Cannon Street and Cudworth Terminii. The steepest incline was 1/100 on the eastern approaches to Drewton Tunnel. The line carried fourteen passenger trains per day when opened. The fastest scheduled time for the 53 mile journey was 108 minutes. The line owned three engine sheds, Springhead, Alexandra Dock and Cudworth. Cudworth was an eight road straight shed. Springhead works was closed for anything but light repairs in 1924 with the skilled men being transferred to Darlington. The line started out by serving the two collieries of Upton and South Hiendley, though it eventually served sixteen collieries. The line carried 65 goods trains each way per day in 1900. Sentinel railcars were commonly used on passenger services in LNER days. The Alexandra Dock with its 46.5 acres of water area, was the largest dock in the north east in 1885 and for many years afterwards, particularly after it was increased by 7 acres in 1889. Joint working was undertaken with both the Great Central and Midland Railways. Several Class A 0-8-0 (LNER Q10) tender engines were loaned to the NER throughout the duration and beyond the end of the First World War. Thank you to John Broadwell for most of the above information. Thank you to Richard Barron for the Ouse Bridge information and photographs, and the Drewton Tunnel photograph.